Hello, everyone! Do you know that I used to be a cat-lover? Well, until now I love them, it’s just that sadly, I know I cannot be a responsible cat-mommy at the moment, so we don’t have any in the house. When I was young, probably grade 3-6 young, I used to take care of a bunch of cats and kittens. The largest number of cats I had was 6! When we moved to a new house, I unfortunately lost my pictures of them, together with the negative films. Anyway, I called them Patty (the only white male), Mimi (the mother of all), Milky (white female with one blue eye), Bulldog (another white female with brown eyes and she’s my favorite because her fur is so nice parang may breed and she’s the fattest!) Mimay (white and orange female, just like her mom, she has a short tail and she is the most fierce of them all) and Julia (the only daughter of Mimay). The rest is history. Mimi had kids. I grew a little older so I took charge in taking care of them right after school. I didn’t bathe them. I fed them. I cleaned but didn’t cut their nails. I combed their fur and made sure its clean. Most importantly, I played with them. I made them take an afternoon nap with me. All the 6 of them by my side. I walked them to our ground floor. Oh, those were the days. For 4 years, they were my only playmates, my friends and my children. I witnessed how they matured, fell in love and gave birth. I even witnessed how they terminated their newborns. Then, we moved to a new yet smaller house. No more ground floor for the cats to terrorize. I went in high school. We let them live in the open because our home setting and even our lifestyle do not fit into petting cats anymore. My tito had a grandson to be busy with. One day, they just disappeared and never came back. A few kittens were left to us. They were Mimay’s, if I’m not mistaken. I remember asking my classmates and friends in high school whether they want to adopt them. Good thing, they were accepted into new homes and families. I miss them. I miss petting cats. I miss their companionship and their friendship. But, you know what, my son Jonath is very vocal about his desire of taking care of cats and he doesn’t even know this story, this love, I have for them. So, maybe, someday. Let’s see in the future. 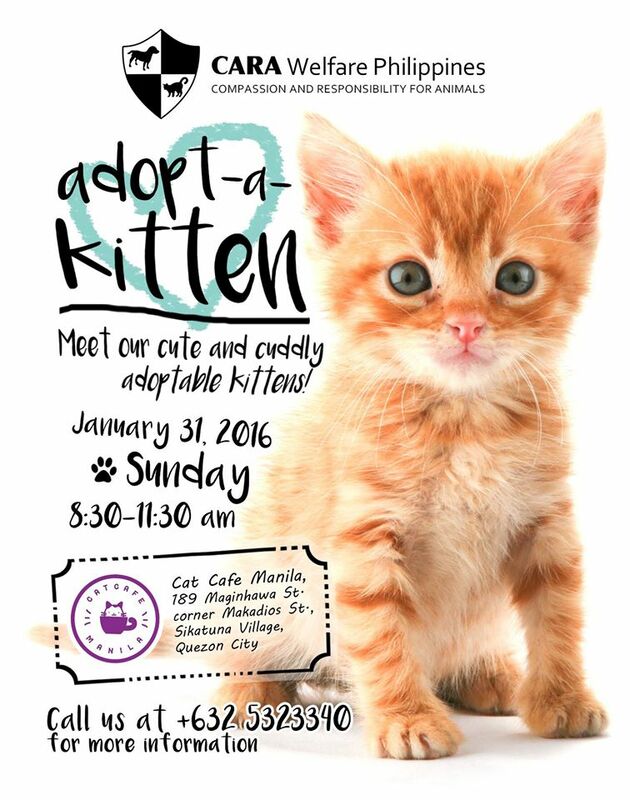 For now, allow me to invite you to the Adopt-a-Kitten project by CARA Welfare Philippines, which is happening this coming Sunday, January 31, 2016, 8:30-11:30 AM at the famous Cat Cafe located at Maginhawa St., Quezon City. For more details, please see poster below and visit their FB Page! 0his post is in honor of my playmates and friends, Patty, Mimi, Milky, Bulldog, Mimay and Julia who all had an important and special role in my childhood. Now that I am a mom of two toddlers, I can’t help but think that years ago, I was trained by cats to become the mother that I am now. Yeah, before I became a mom to Jonath and Claret, I was first a mom to cats.